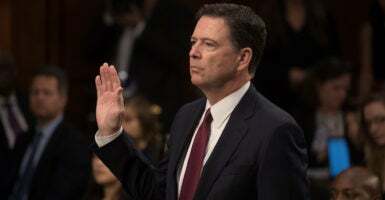 Portions of former FBI Director James Comey’s new book on the end of his law enforcement career conflict with the facts as presented by the Trump administration, Comey’s recently fired top deputy, and both Republican and Democrat leaders. “My experience with Comey is [that he is] a patriotic, engaging, smart American who tried to find the right, apolitical result for the FBI at a time we had two deeply flawed presidential candidates,” Ron Hosko, a former assistant director of the FBI’s Criminal Investigative Division, told The Daily Signal, referring to the agency’s probes of Donald Trump and Hillary Clinton in 2016. Others are more skeptical of some of the assertions by Comey, 57, in “A Higher Loyalty: Truth, Lies, and Leadership,” to be released Tuesday. 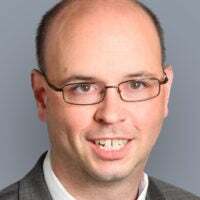 “You know you’re in trouble in Washington when neither the left nor the right, Republican or Democrat, takes you seriously any longer,” J. Christian Adams, a former Justice Department lawyer, told The Daily Signal. “I don’t think this book will be read by many people. I don’t think we’ll be talking about it in two weeks,” Adams said. Here are four key issues Comey has emphasized, some mentioned in the book and his interview with George Stephanopoulos of ABC News that aired Sunday night. Comey used bad judgment in publicly talking about the Clinton case both in his July 5, 2016, press conference, and when he briefly reopened the case Oct. 28, 2016, said Hosko, now president of the Law Enforcement Legal Defense Fund, which provides legal advice and covers some legal fees in duty-related cases. In the July press conference, Comey concluded his remarks by saying “no reasonable prosecutor” would pursue charges against Clinton even though she had been “extremely careless” in conducting official business over a private email server. The FBI should leave public announcements to federal prosecutors, Hosko said. In the book, Comey reportedly says he wishes that he had announced at the top of the July 2016 press conference that the FBI would not recommend prosecuting Clinton regarding her classified communications as secretary of state on a private email server—as opposed to building up the suspense and saying that toward the end. Comey announced the reopening of the email probe in late October and then announced it was again closed the weekend before the election. I don’t remember spelling it out, but it had to have been, that she’s going to be elected president and if I hide this from the American people, she’ll be illegitimate the moment she’s elected, the moment this comes out. … Like many others, I was surprised when Donald Trump was elected president. “If Trump had been up 15 points in the polls, what would be the point” of announcing publicly the email probe was reopened, he said. One week after Comey’s May 2017 testimony to the Senate Judiciary Committee, the FBI issued a correction of his explanation of why he had reopened the Clinton email investigation 11 days before the Nov. 8 election. The probe was reopened, the bureau said, because of a laptop used by former Rep. Anthony Weiner, D-N.Y., then husband to Clinton aide Huma Abedin. Comey told the committee that Abedin had a “regular practice” of forwarding emails to the laptop and that “hundreds and thousands” had been forwarded, including messages with classified information. 2. Trump Order or ‘Hope’ on Flynn Investigation? Comey maintains in his book that Trump sought his loyalty, writing: “The demand was like Sammy the Bull’s Cosa Nostra induction ceremony.” Comey was referring to Salvatore “Sammy the Bull” Gravano, once the leader of the Gambino crime family. Comey writes that he “did not interrupt the president to protest that what he was asking was inappropriate, as I probably should have. But if he didn’t know what he was doing was inappropriate, why had he just ejected everyone [else from the Oval Office, to speak privately]. Hosko, the former FBI official, said there was reason for Comey to believe the president was giving an indirect order on Flynn. “It could be construed as an order or a wish from someone who has the power to fire you,” Hosko said. Adams, now president of the Public Interest Legal Foundation, which monitors voter fraud, said he believes there are clear questions about Comey’s leaking. “It appears he wasn’t telling the truth in front of Congress, but I don’t think anything will happen to him,” Adams said. During the Senate intelligence committee hearing in June, Comey explained how he leaked his FBI memos through a friend who is a law professor, to spur appointment of a special counsel. The so-called Steele dossier, a raw, unverified, 35-page document alleging ties between Trump and the Kremlin that included lurid allegations regarding Russian prostitutes, was a big part of Comey’s interview on ABC News. Comey told ABC’s Stephanopoulos that he didn’t inform Trump, in describing the document during his first meeting with the newly inaugurated president, that it was the product of opposition research. Comey said he isn’t “sure” how much of the information in the dossier checked out. “The answer is, I don’t know,” he said. In a March 2017 hearing by the House Judiciary Committee, Rep. Peter King, R-N.Y., asked the FBI director about the leaking of the fact that Comey briefed Trump on the dossier.